The printable ears come in two sizes – one fits 9″ plates and one fits 7″ plates. I bought my plates at Party City. To make the ears I simply printed them out on white card stock, cut them out, and then taped them onto the plates. So easy! Ah! So much cuteness!! 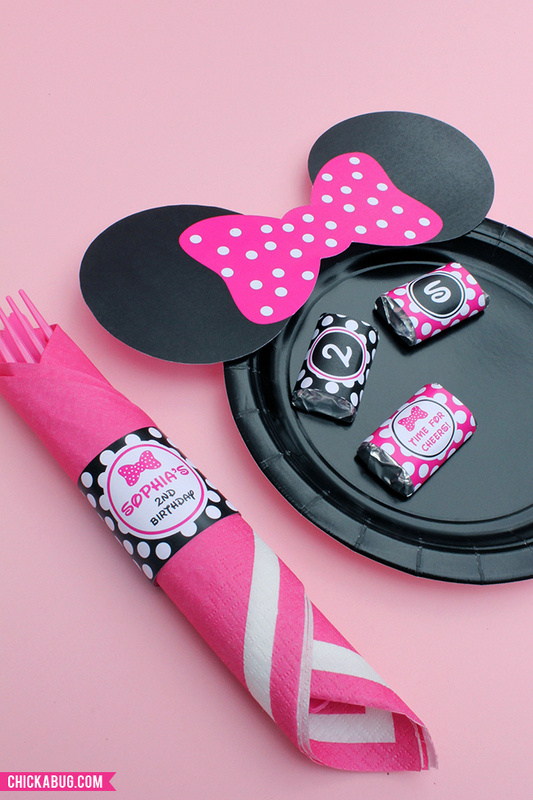 This is a place setting that any Minnie Mouse fan would just have to love! Was trying to print free Minnie mouse ears for plates and was unable to. Can you send it to my email or fix the problem please, thanks a bunch! I wasn't able to download the printable. Can you send a different link or send it to another email. Hi, I love this printable! Is there anyway for me to change the bow color to red on my computer? I love the printable items on your site. Is there an option for me to change the color of the bow to soft pink for the minnie ears plates? Thanks a bunch! Hi Kimberly! Right now I only offer the free printable in two colors: red and the shade of pink shown in the post. It's bringing me to a lage that says cannot find. I really need these. hi i would like to have free minnie mouse ear (red). can u please send it to me? OMGoodness I absolutely love these!! I have what may seem like a silly ?? but I was wondering what would be the easiest, sturdiest way to attach the ears to the plates? Would stapling them look to silly? Taping seems like they'd fall off quickly...maybe hot glue...I'm just curious what your experience has been if you've tried these. Thank you in advance...and once again I LOVE these ideas!! I'm so glad you like them! : ) I just used tape since it was just to take pictures. For a party I'd say hot glue, if you print the ears onto sturdy enough paper (heavy card stock). I hope this helps! can you please!!!! send me the plate ears in my email??? it wont load on the site. hi I love all of your decorations and little Minnie mouse items is there anyway to get it in red instead of pink? Hi there. I want to download the ears and also buy a few bits from your website, was just wondering if the pink in the bow of the free ears are the same shade of pink as the bits to buy? 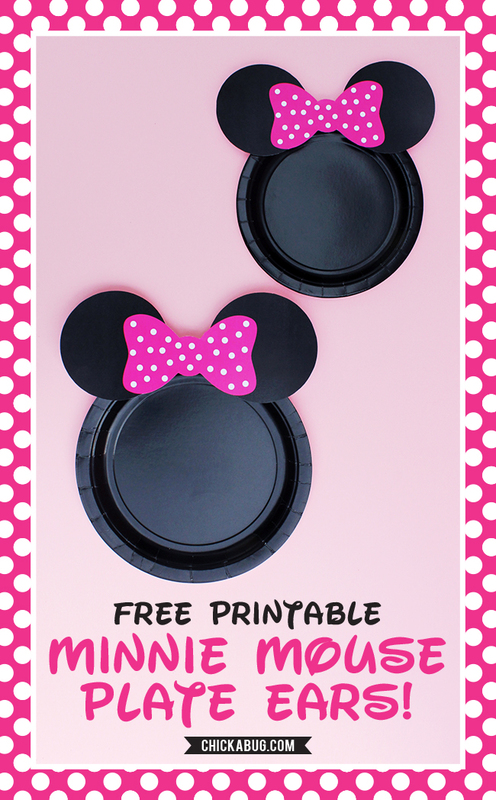 I can't find the free printable for the minnie mouse ears for plates. Could you please send it to me? Thank you, they're adorable!!! Hi Alexis! Just click on the download links in the blog post. Why I cannot download the red version? Can you email to me? Thanks. Hi Aidee! Unfortunately, I only offer the "Minnie" version. Sorry! Hey there! What type of paper stock would you recommend for printing out the ears? Hello were can i get the Free Minnie Mouse ears for plates i need the red and white. It's easy, just download using the links above. hi i'm knew to this. i'm trying to print the ears with the light pink bow how do I go about doing it??? These are perfect! Exactly what I'm looking for. Thanks!!! Hi there is the baby pink still available to print for free?? Love the idea but I have tried several times & it's a blank screen. Thx appreciate you! I used white card stock, Staples brand. Only download ONE set. Choose either hot pink or baby pink. The files are exactly the same except for the color. Thanks for the free printable light pink minnie mouse ears.Using them for my daughters baby shower. Hello, I was wondering is there anyway I could change the color of the bows, because my daughter is in love with Minnie Bowtique and she wants all the plates to be different colors, the colors we are using are pink, purple,lime green,orange,yellow,sky blue. Thanks a bunch. I am interested in the hot pink bow printable. How to I get that? Is it free or is there a charge? How can I get this free printables? Click on the download links above. Thanks! Would you be able to change the ears color to gold with the pink bow? There's no way to make an editable file where the user can change the color of objects, sorry! Hello! I love these! Do you know if they will work on the party city 10 1/4 inch plastic disposable plates!? What kind of paper do we use to print these with? Card stock or regular printing paper? Use card stock. I don't think regular printing paper would hold up well enough! Hi, how do I print these and what kind of paper do I use? I downloaded it into my adobe reader on my phone but I dont have a printer at home so how would I be able to print it out at skynet? And what do I use to stick it to the plates? Hi, what do I use to stick it to the paper plates? Hi. When I click on the link nothing is showing up :(.. Trying to get the printable ears for the party. Hello! Wondering if I can have the hot pink and light pink sent to my email!? I'm going to have them sent off to print. They can be downloaded using the links above. Thanks! You can use the links in the blog post to download the files. Thank you! This is a cool idea! Thanks so much Heather, this saved me quiet a bit of money. Would like the plate ear printable. Hi Ashleigh, Sign up for our newsletter following the instructions in the post and you'll get an email with a link to download. Thank you! Hi Tonya, Please check your spam folder - the email will be from shop @ chickabug.com. Thanks! I received an email with a link, but not a download for the free ears. The link sends me to your shop. The link in the email is https://blog.chickabug.com/downloads - please use the password in the email to sign in. Please check your spam folder or search for an email from shop (at) chickabug.com. Thanks! I am trying to download the free minnie mouse ears printable but unable to! Can you help? Hi Alaina! You can download the adoption certificates by following the directions in the post. Once you've done so please check your email (including spam) for a message from shop (at) chickabug.com. Thank you! love all these ideas! perfect for my daughters party! Hi Angel, I added you to my list. Thank you! Very good!! I like a lot! love your stuff! sooo cute! excited to check out the rest of your blog! thanks for making my daughters' 1st ( minnie mouse themed) birthday sooo cute, easy, and most of all stress free and lots of fun!!! My grandniece is having her 1st Birthday. The theme is Minnie Mouse. Just came across your website and I would like to use the free printable Minnie Mouse Plate Ears. Thank you in advance. I need minnie mouse ears for plates please! So Cute - can't wait to use them! 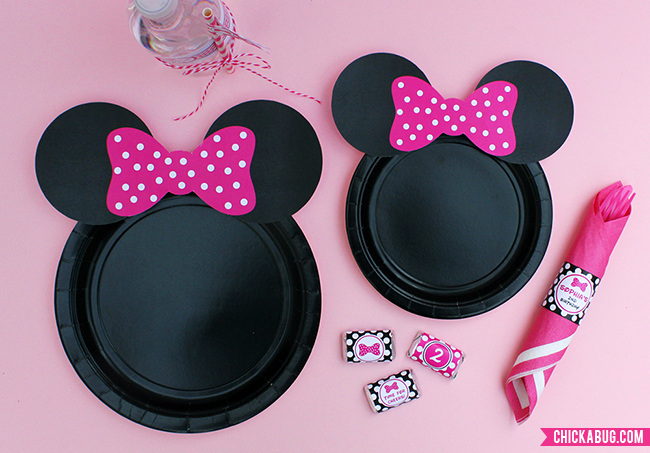 Hello, I can not find the link to print out the Minnie ears for the plates. Can you please help? Hi Marlena! When you joined the VIP list you got a message from shop(at)chickabug.com. Look for that or search "Chickabug" in your email and it will come up. The email has the link to the free downloads. I hope this helps! Hello, I was trying to download the dark pink Minnie ears for plates for my daughter's 2nd birthday party but wasn't successful, can you please help with providing the actual link as you did for the red Minnie ears from a previous response? I read all of the post below, used all of the hyperlinks above, entered my email address twice (checked my Inbox/Junk (Spam)) and still nothing. Hello, I tried entering two other emails to receive the link for the dark pink Minnie ears for plates and still haven't received anything (I checked my Spam/Junk inbox as well); can someone please help? hi, i cant seem to find the download button. i want to get the dark pink minnoe ears for the plates. ty! i cant seem to find the link to download the ears. pls help!! ty! Hi Bridget! When you joined the VIP list you got a message from shop(at)chickabug.com. Look for that or search “Chickabug” in your email and it will come up. The email has the link to the free downloads. I hope this helps! I love all the designs... your are so creative... My guest will be in love with Mini's theme party. Was wondering if you can make one with pink ears and a gold bow?! My daughters first birthday theme is pink and gold Minnie Mouse and this would be so cute! I am wanting to print the plate ears, but I'm not finding the links. I have already signed up for VIP to where I can receive free downloads, but it just takes me back to the same page and no links. I am wanting to print these for my niece's 1st birthday party tomorrow. Any assistance would be appreciated. Thanks. Disregard. I finally found it. I can't wait to use them. Thank you. Where did you finally find the link? Trying to print for my daughters 1st birthday. Hi Candice! When you joined the VIP list you got a message from shop(at)chickabug.com. Look for that or search “Chickabug” in your email and it will come up. The email has the link to the free downloads. I hope this helps! Hi Tania! When you joined the VIP list you got a message from shop(at)chickabug.com. Look for that or search “Chickabug” in your email and it will come up. The email has the link to the free downloads. I hope this helps! I signed up for the free Minnie mouse ear plate printables and I do not see the option to print them in the email I was sent. When I click the link in my email, it brings me to the page, but I do not see the free printables print link. I signed up so I can print the free ears, but I haven´t receive any email (neither junk mail). What else can I do? Hi I love the ears! Do you have gold ears with a baby pink bow or baby pink ears with a gold bow? I cannot find the link to click on to download the ears? Hi Laura! When you joined the VIP list you got a message from shop(at)chickabug.com. Look for that or search “Chickabug” in your email and it will come up. The email has the link to the free downloads. I hope this helps! Hi, I do not see the link to download the minnie ears printable..Could you direct me to that? ptinting of ears and pink bow!! Printing of ears and pink bow!! it wont send me the email so I can print! Hi Ana! When you joined the VIP list you got a message from shop(at)chickabug.com. Look for that or search “Chickabug” in your email and it will come up. The email has the link to the free downloads. I hope this helps! Hi, I love this printable ! 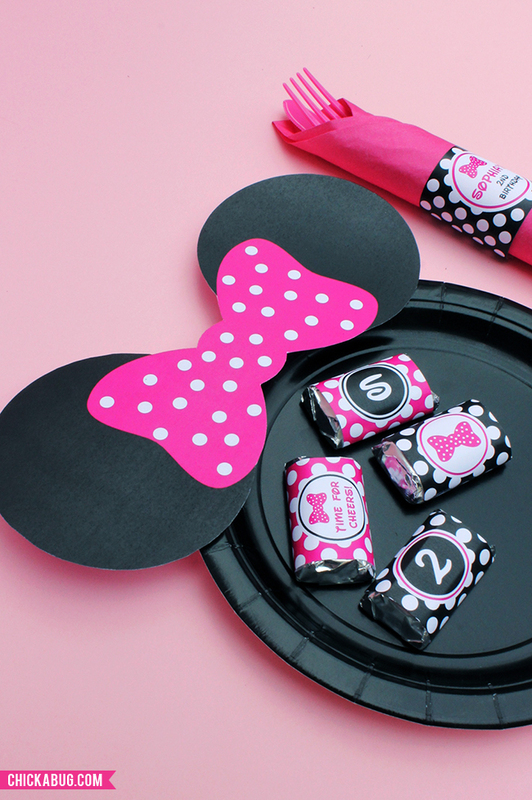 I'm trying to print the minnie mouse ears and bow for the plate but can not find the link to do so. Could you please point me in the right direction or email the link to me? Hi Shelbie! I saw you opened the email and clicked on the download link, so everything should be ok. If not, please let me know. Thanks! I joined and have not received the email. Hi Melissa! Looks like you've received the email 3 times. The message is from shop(at)chickabug.com. Try searching “Chickabug” in your email and it will come up. The email has the link to the free downloads. We will also email you. Thank you. I will check in the morning. Hi the email came in (only once) but the link takes me to a page that cannot be found. Hi I wanted to download the hot pink plate ears. How do I find the link? Hi Theresa! Looks like you've signed up for our mailing list and the email with the instructions for downloading has been sent, you're just not seeing it. It must be going to "promotions" or spam. The message is from shop(at)chickabug.com. Try searching “Chickabug” in your email and it will come up. The email has the link to the free downloads. We will also email you. Hi Alisa, Looks like you got the email and opened it, so you should be fine. If not, let me know. Thanks! I'm so satisfied with the printout. I am using these for my baby shower in October but I have already put some plates together. I LOVE IT!!! Thank you so much for sharing this temple. Hi!! I wanted to know how to flint those bauti full Minnie’s ears for the plates!! Love the light pink ones!! Thank you!! Hello, I do happen to have minnie mouse ears with a sky blue bow? Hi Bridget, Just the colors shown in the post, sorry! Hello. I am having trouble locating the link. I received the email and typed in the password, however it keeps bringing me to the original blog post and asking me to download again. Is there a way to email the file? Thank you. It's not sending to my email. I just emailed you at step-----yahoo.com. Thank you so much for this wonderful idea. Would you happen to have the bows in purple? Please email me if you do. Appreciate it your hard work. Hi Jessica! Sorry, I don't have them in purple. I’m unable to receive the email to download the Minnie Mouse printables can you please send them to me? I did not received any email. Hey , I haven’t received the email for the free printable ears , I would like the pink ones. And also what paper is it best used for ? Hi Imari, Card stock is best. I did not get the link yet, can you resend please. Hi Britney! The email may have gone to spam. You could try searching for “Chickabug” and it will probably come up. I've also emailed you. Hi Lauren! The email was sent to la------@icloud.com. The email may have gone to spam. You could try searching for “Chickabug” and it will come up. I'll also email you. I try to submit my email add twice but I didn't receive it. can you please send me ?? My welcome email will not all me to click where it says “click here”, such as there is no link to my printable. Hey there -- are you able to send this printable to my email? I'm not sure why I haven't received.... checked junk folder. Hey Can I download the ears it didn't come too my email can you please sent it too me. Hey, can you send in a PDF It didn't come too my email also do you have bubblegum pink? Hi Mary, I just emailed you. I only have the colors shown. Thanks! I really love it. Thank you so much to share your art with us. Hello, any way you can do Daisy Duck? I thank you all cause I didn't have enough money to make my foster baby a nice character of minnie mouse. I'm so excited thank thank this website and God. I'm crying. Thanks!!! Hello! I have joined the mailing list, but never received an email with the password to download these... Did I do something incorrectly? I entered my email address a month ago but have never received an email in inbox or junk folder. Just curious if anyone else is having an issue receiving. I did not get anything in my e-mail or spam.